Help disabled and elderly people become an asset to society thanks to connected car technologies! For many societies driving a car is not just about physically getting from point A to point B, it represents a way of life and personal identity. In America for example, driving is nearly universal and an essential function for living. Unfortunately, people who have or develop physical or mental impairments have to forego driving and often lose independence compromising their ability to work and provide for themselves and/or their families, have difficulty maintaining social contacts, continuing personal interests and hobbies, and participating in community activities. These losses have a heavy impact in terms of emotional and physical well-being, quality of life, and evaluation of self-worth. There are several conditions that can restrict or impair one’s ability to enjoy driving or safely operating a vehicle altogether. The automotive industry is deploying exciting new technologies that will allow cars to connect with the outside world and enhance the in-car experience. Beyond safety and crash avoidance, Connected Cars may present a new opportunity for people with conditions that restrict driving to enjoy driving experiences unlike anything we’ve ever known. 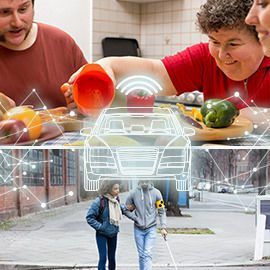 Our sponsor, a research and innovation company, invites you to think of how connected car technologies can be used to help disabled and elderly overcome their impairments to operate a personal vehicle to avoid social isolation. Can you help? Imagine new connected car solutions that help disabled and elderly overcome visual, auditory, cognitive, and motor abilities impairments to legally operate a personal vehicle and achieve interdependency in their communities. You can submit your entries until 27 January! Good luck!